To be fair, the dev on Inside Xbox did not specify native 4K for Division 2, he just said something like "we will support 4k resolution". I doubt it will be that much higher than the 1800p we got in the original Division. So the back cat enhanced stuff is fully dead then? Where did you get that assumption from? We got 7 brand new enhanced games in October and November. As has been stated before these require a lot of extra work and they usually save up a few to launch at the same time so I doubt we will see anything new for a while after the FFXIII trilogy last November. I suspect they'll have a BC focussed Inside Xbox in the next two months or so with some new enhanced titles and OG Xbox games. Hmmm, I’m very curious how the game runs in 4K mode. It is a fighting game after all and it certainly won’t be worth the resolution bump if the games frame rate is all over the place..hopefully it’s just occasional minor dips. You seem to be misinformed. The patched 1st Division was dynamic 2160p keeping the resolution 90% of the time (or even better). It was even mentioned in the latest Digital Foundry video from today besides that their pixel counting from the beta code points to native 2160p again. From the footage they had they couldn't identify a single instance of a dropped resolution. What made you ask this? There is no way Anthem is 30fps if the demo is representative of the final product. Bioware said there are literally thousands of bug fixes that are in the final code that weren't available when they branched out the demo. Now if that means it'll be a locked 30 is still to be seen. No way can they launch it like the demo. Because for one it just is barely stable ever, except the interiors that are smooth and two it's significantly performing under base PS4 and Pro. Come the hell on now. I don't believe that has happened ever, and neither should it. Target framerate is typically listed regeardless of how often it hits it. Ah, never mind my comment than. I was under the impression that Division was 1800p like Assassins Creed Origins and Odyssey. My bad. Great to hear its actually native 4K! Those listing always reference the target frame rate which btw is a common practice by all platform holders and publishers. Though I will agree Anthem needs some more optimization for the Xbox One X. Indeed. np. Btw both ACs are Dynamic 2160p also. You should check your sources, bro ;) (those dynamic ranges in the OP are for measures drops, not representative to 80% of the time). I asked one of the programmers worked on the render engine about it just before the release of AC Origins and he confirmed it to me. Oh, wow, Metro Exodus is Atmos?! Thank you, I always appreciate the heads-up on this. The Orange Box, Portal: Still Alive, Left 4 Dead, and Left 4 Dead 2 just got X Enhanced in late October. Oh, and FFXIII and its sequels. I don't understand where you're drawing this conclusion from, but I'd say no, it is definitely not dead. And, as always, I will try to put in the OP if a title is prone to frame rate drops. Does Atmos work regardless of whether or not you're using the Atmos app? I have it but I know compresses the sound quality down to 16-bit 48KHz, which is a bit less than ideal. Can anyone tell me if Alan Wake runs much better on the Xbox One X than the 360? I want to replay it, but I can wait until I get a One X someday if it's worth the wait. About the frame rate drops with Anthem we should wait for the final product. I don't know if there already patches day 1 that may correct that. That said I will pass on the game anyway. There is only so much time for one game this type and I decided to go with The Division 2. On the X it will benefit from a few hardware boosts like forced v-sync and 16x anisotropic filtering along with just better performance overall. I would hold off until you can play it there. Runs pretty much locked on Xbox One, plus no more screen tearing. Only benefit of the X would be 16x AF but you won't notice that a lot in a game like Alan Wake. I feel like in situations like this we always hear “the demo is an old build the release version will be better” and it almost never is. I was getting drops that felt sub 20 in the empty hub city. I agree in this case the code was not as old like in other betas recently. But it is normal to branch into another development path for the demo while optimization for the main game is ongoing. I would assume the demo is between 1-2 months behind regarding console-side code optimizations. I am certainly not talking about server-side optimizations because that was their whole reason to release a public beta. And it showed that they were not ready the first time. Both beta phases should had helped them to find the most annoying bugs in their net code. You need the app in order for the Xbox to process Atmos, then you need to set your sound output to "Atmos" in Settings (which it sounds like you do). Where are you getting the information about it compressing the signal? Atmos is going to be a 48Khz no matter what (in the home), due to processing limitations. I looked into your 16-bit claim, but in the PC space 24-bit 48Khz is an option, so I don't see why it wouldn't be the same for the Xbox. Bear in mind, I'm not in front of my AVR to test and see what Xbox Atmos feeds are being reported as. I always do, but I just thought it worth mentioning that I try to cover as many bases as I can with the OP. Speaking of, I am knee-deep in researching Variable Refresh Rate titles. I am looking forward to sharing my data with everyone! I can’t remember a single instance with an “Alpha/Beta/Demo” this close to release that saw any improvements at all performance or IQ wise to the retail build. Anthem better be the first because the game can’t launch with that performance. I can’t believe they launched the demo in that state, game desperately needs a dynamic resolution. I don't know about the overall output resolution but I can confirm both XB O X and PS4 Pro offer HD textures for Apex Legends. The Div was mostly 4k on the X only dropping ocassionally and never to much from native. I won't be surprised to see The Div 2 being native at all times. Ha! Don't give me too much credit here. I don't have the resources of a Digital Foundry, let alone the technical prowess (I still can't pixel count worth a damn, haha). The only definitive source I was able to find, and it was completely by accident, is Microsoft. Who'd have thunk it?! It bears mentioning that the Xbox One S can do VRR, same as the X, but I am limiting my findings only for X Enhanced titles. Oh, nice! I had a little bit of time to fire up Apex Legends for the first time after work yesterday. It definitely doesn't look 2160p. I wouldn't be surprised if it performs the same as Titanfall 2, fluctuating from 1800p to 1440p, as I thought the image looked a little soft (maybe closer to 1440p?). I'll defer to the experts who can pixel count (Read: not me) for the final say, though. More stuff going than Titanfall bro especially the amount of players so it's kinda expected. There is still hope for optimisations though especially if the games meets so much success. Fortnite for example went from 30 FPS to 60 FPS with higher resolution updated later for XB O X and PS4 Pro. Yep! I noticed that too. While Apex definitely looks really nice for a game with a engine that old, it absolutely looks somewhat soft. On top of that I sadly also noticed aliasing here and there. Nothing like a base Xbox One game or anything but neither a clean as hell image like Shadow of the Tomb Raider and RDR2. That's a 60fps encode, if that's what you are getting at! I look forward to that. After having seen the benefits of VRR in KH3 I really want to try out some other games. I just can't come up with any. Would not a 1080/60fps mode be possible? As mentioned in this post, Microsoft's Xbox store page lists, among other things, whether a title features Variable Refresh Rate (VRR). Outside of physically testing all 1,873 Xbox One games, according to Wikipedia, this is the only definitive information I could come up with for support of this feature. For example, the image below is what Gears of War 4's Xbox store page lists under "Capabilities." And, though the Xbox One S also supports VRR, I am but a mere mortal, so I only list the feature for titles that are X Enhanced (which is in line with the thread's purpose, anyway). So, without further ado, I have updated the following titles in the OP with their support for VRR. Also, remember all Xbox One and Xbox 360 titles without X enhancements get VRR. "Better shadows, better AA, better anisotropic filtering, far better screen space reflections, and post-process profile", across both modes. Enhanced god rays, dynamic shadowing, further draw distances, surface space reflections, and higher resolution textures. Improved textures and filtering, draw distance, shadows, lighting, AO, LoD, Dynamic Resolution option. Improved textures, Dynamic Resolution option. Increased texture resolution, shadow detail, foliage density, ambient occlusion, and higher draw distance. Increased shadows, texture resolution and filtering, higher quality vegetation. Dev compares to "visuals from the high-end PC version." But Wolfenstein 2 has VRR and is X-enhanced. But Wolfenstein has VRR and is X-enhanced. Where are you sourcing this information from? 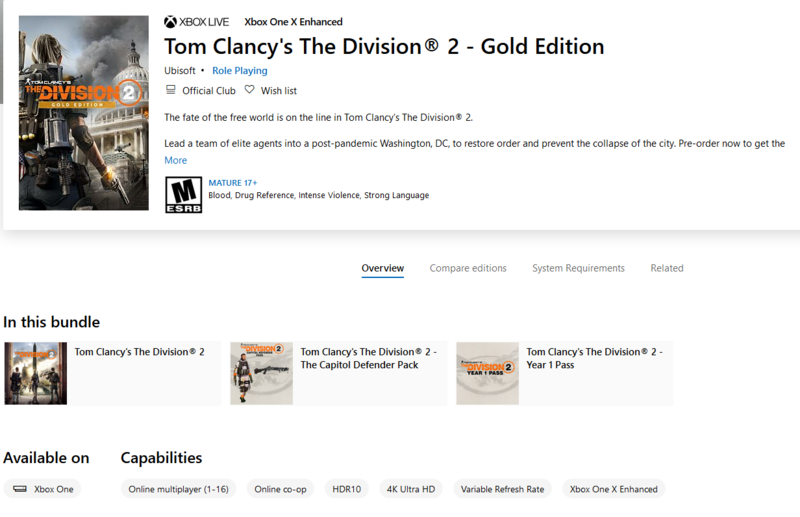 It is not listed as a feature on the Xbox's store page. I don't have a FreeSync display/TV; does the display provide information if it is receiving a VRR signal? As mentioned above, the Xbox store page is the only foolproof way I've been able to determine whether a title supports VRR or not. And, well, gotta start somewhere. 😜 Admittedly, I'm sure titles are missed on the store page. Shoot, even Microsoft's X Enhanced list has errors/omissions. So, I definitely defer to the community for help with this and am especially grateful for the assistance. Well its the title that DF used to test FreeSync and it worked brilliantly. That video is encoded in 60fps but the game runs at 30fps. I noticed the tag early last year too, but since the Digital Foundry video of them showing benefits of VRR for Wolfenstein II, I think it was, I just kinda ignored it since then. I have Hellblade listed in my old post, but it's not listed on the store page now. I think maybe some of them lost it when they moved from using lists for "capabilites" to using the "bubbles" they have now. btw Pillars of Eternity still has a tag, but for "Variable Refresh Rate" rather than "VRR" (I think they used "Variable Refresh Rate" back then and now use "VRR," I'm not really too sure). I think DF here assumed FreeSync was system level but I thought it was title by title? Might explain the games that did not show a difference, some games have the VRR tag some dont on the store. To be honest I had totally forgotten about the FF games, and was there not a report about them slowing down or stopping? Gotcha; I assume this is the article you're referring to? So why choose the Asus VP28U? It's hardly at the high-end when it comes to FreeSync-supported monitors, but Microsoft tells us that it uses an Asus monitor for testing owing to its 'Game Tools' FPS counter (other display manufacturers may also implement this feature). It can't measure game frame-rate accurately but it can keep track of the display refresh rate, which is tied closely to game performance when FreeSync is active. This is actually a hugely valuable tool in figuring out how variable refresh is implemented on the Xbox platform, because it turns out that it's very, very different from its AMD PC counterpart. It's very much work-in-progress right now, results can be variable, but when it does work, you're in for a treat. Thanks for this! 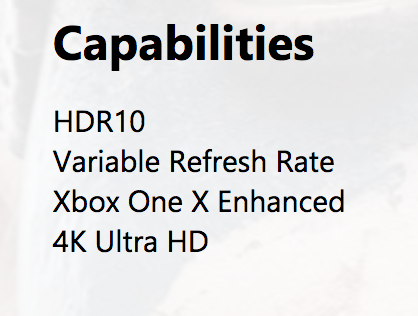 I've only seen VRR listed as "Variable Refresh Rate" on the Microsoft's Xbox store pages, so that aligns with what you've seen in the past. So, Pillars of Eternity is still correctly showing the feature. Wolfenstein, however, is not. And neither is The Vanishing of Ethan Carter. Pillars of Eternity is not an X Enhanced title, so it won't be in the OP. As has been discussed in this thread, we're in a sticky area: there's just not a lot of information out there on VRR support. Now that I am cataloging it, though, I'll certainly be paying closer attention. I don't have a FreeSync display, so, as always, do please let me know if you've read/experienced VRR in a title that doesn't reflect it in the OP. I doubt they'll hit 60fps most of the time. The VRR support likely indicates it has a performance mode, similar to games like Tomb Raider. As long as the frame rate is over 40fps, VRR should be enabled. it was a big deal when it happened, don't know how you forgot that so quickly. Also the DF review said it was flawless... no slow downs. Doh! Apologies, I guess I got carried away thinking about the VRR tag and forgot about Xbox One X (the topic of the thread). I honestly didn't know that the Xbox One S could support VRR until I saw it mentioned here.